MANILA, Philippines - “Almost but not quite.” The Star Hotshots almost had game 3 with a half shot lead with 13 seconds left in the ballgame. But Super Marcio Lassiter foiled their premature celebration with a cold blooded three pointer as San Miguel got away with the 111-110, 2-1 series lead on June 14 at the Smart Araneta Coliseum. With the series that at 1-1, obviously the winner of game number 3 will be having the biggest advantage heading to game 4. As Charles Rhodes said during in an interview after their previous game: “Yeah man, this gonna be a dogfight.” Pertaining to the most awaited game 3 of their race to 3 semis series. Charles Rhodes despite a bad start in game number 2, still won the Best Player of the Game with 25 points. As early as the first quarter, Rhodes made sure that he would be really outclassing his rival Ricardo Ratliffe. Alas! As early as the 7 minute mark, Rhodes had already tallied 9 points. And what was even better, San Miguel led Star by 9, 19-10. Ricardo Ratliffe, who had a monster game last time wanted to replicate his performance and match the firepower that Charles Rhode’s giving his team. Ratliffe had 10 with 3 more minutes remaining in the first quarter. Ratliffe got a scoring aid from Paul Lee who beat the buzzer and closed the opening period 32-28. At the start of the second, the Beermen brought the lead back to double-digit, a dozen to be specific. Charles Rhodes initiated the attack and recorded his 18th point with 8 more minutes remaining in the 1st half. Ricardo Ratliffe on the other hand was just 4-point shy of Rhodes’ 18. In just 4 minutes after SMB posted its dozen lead over Star, Hotshots all of a sudden exploded and chopped the big lead to just 3. Coach Leo Austria called for a timeout to kill Star’s scoring run and momentum. Coach Austria’s 30-second break had just gone to waste as the Hotshots took the lead, 50-49 courtesy of Ian Sanggalang. Coach Leo had no choice but to burn another timeout as he wanted to end the half with the lead back to his side. The Beermen managed to take back the lead after Coach Leo’s 2nd timeout, 56-52 as the 1st half wrapped-up. Ian Sanggalang drew the first blood in the third quarter followed by Ricardo Ratliffe for the tie, 56 all while Chris Ross moved SMB’s score who became idle in the last 4 minutes seconded by Charles Rhode’s emphatic reverse dunk that made all the fans jumped off their seats. A word war erupted between Charles Rhodes and Ian Sanggalang after the latter unintentionally pulled Rhodes to floor. All players on court restrained both Rhodes and Sanggalang to prevent an altercation. To summarize the third period, it was purely a seesaw battle between the opposing squads. Aside from the lead changes, bodies were flying left and right proving that this series is nothing but an intense and thrilling one. Paul Lee who was playing a mediocre basketball this series finally broke out of his shell and had already chipped in 18 points with 1 more quarter to go. Transition offense had been SMB’s bread and butter during the dying minutes of the penultimate quarter that gave them the decent lead of 6 after the long seesaw action. One of the highlights was Chris Ross’ clean block on Paul Lee that led to Charles Rhodes slammer. Charles Rhodes made 2 successful dunks before the third ended but Ricardo Ratliffe retaliated with his own version of a slamma jamma and made it more interesting when he did it in Charles Rhodes’ face plus a foul. 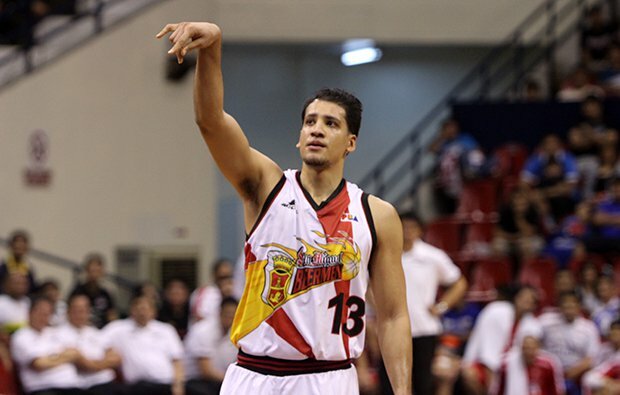 Marc Pingris taunted Charles Rhodes by imitating the latter’s “get out of my way” gesture. Rhodes didn’t like it and confronted Pingris at Star’s own bench. Luckily, Rhodes wasn’t slapped with a technical foul. After 3 full quarters of intense basketball game, SMB led Star by 4, 85-81. The guy in short shorts, Jio Jalalon opened the final quarter with a buzzer beating long shot while Charles Rhodes had already surpassed his game 2 total with 34 and 9 more minutes to go in the ballgame. San Miguel was able to ramp up their lead to 9 with 5 more minutes left in the fourth but Star didn’t want to end the night in a 1-2 note so the gang in yellow slowly caught up led by Ricardo Ratliffe and Jio Jalalon. Star was within 2 points with 3:38 remaining in the game. Charles Rhodes went down after absorbing an inadvertent elbow to the face from fellow import Ricardo Ratliffe off the loose ball. However, it was Rhodes who was called for a personal foul that sent Ratliffe to the foul line. For the second time, Ricardo Ratliffe dunked over Charles Rhodes and the entire Star Hotshots bench mocked Rhodes with his “get out of my way” gesture. With that dunk, Star once again trimmed the lead to just 2 with 1 more minute left. Ratliffe got fouled and sank both of his bonus shots to tie the game at 108 apiece. The Hotshots had the possession with 22.4 left and 14 seconds on their shot clock. Ricardo Ratliffe pounded Charles Rhodes under the rim and made a hook shot for the 110-108 advantage and 13 more ticks left. San Miguel had the final possession of the game with 13 seconds to tie or lead the game. Alex Cabagnot took a floater but widely missed. Marcio Lassiter got the long rebound and promptly took the dagger three pointer in Justin Melton’s face to seal the win, 111-110. The Beermen will bring the 2-1 series advantage heading to game number 4 and can finish the Hotshot off on Friday.